Mishmash of Musings: Do You Believe? A year ago, Pure Flix Entertainment came out with the movie, God’s Not Dead. The way that movie came to the local theater and shocked them with unexpected ticket sales was amazing. Check out my blog about it here. 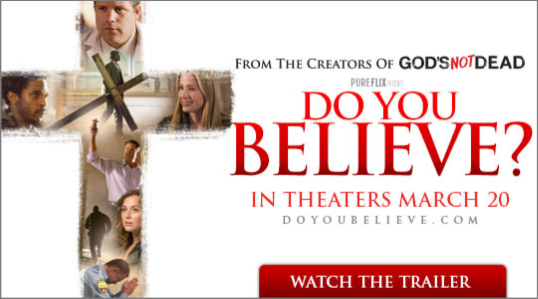 It looks like Pure Flix is about to do it again with their newest movie, Do You Believe. This time, I wanted to see what we could do to help get it into more theaters. Due to some unusual circumstances, I happened to get connected with an Executive Producer for Pure Flix. So I contacted him and asked what we could do. He invited me to attend a prescreening of the film. Do You Believe centers around twelve people. Their lives are interconnected in a way that only God could possibly see. A preacher’s belief in the power of the cross is rekindled and he brings that fire into a sermon. The flames spread to some of those in his congregation, then out into the community. Do You Believe beautifully illustrates how God, the Master planner and multi-tasker, orchestrates events in our lives to reveal Himself and draw us to Him. He gives us opportunities to make the right choice. He loves us. He never gives up on us. None of us are too far for Him to reach. Do You Believe shows the reality of our messed up lives. Even in the midst of that mess, God can transform us when we accept His offer. But that doesn’t change the circumstances. The messes we’ve made still exist. This is still a messed up world. Although circumstances sometimes miraculously improve, they typically don’t. What changes is our hearts and how we react. 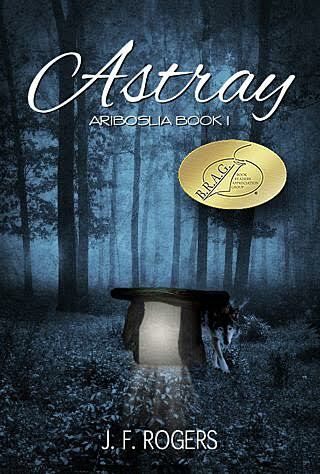 Do You Believe illustrates child-like faith through one little girl … an amazing little actress. Do You Believe shows us what sacrificial love looks like. Do You Believe reveals how people can wind up in certain situations, reminding us that we can't judge people. We don't know how they got where they are. We're simply called to love everyone despite who or where they are. Do You Believe demonstrates that, if we’re following God’s will, our pain isn’t wasted. He uses it to help others in pain. We need one another. We are not islands unto ourselves. Do You Believe sparks thoughts and conversation. My family couldn’t help but talk about all that we’d just seen. The movie is so packed with nuggets of truth, and it’s so emotional, that it takes some conversation to process it all. I need to see it again to absorb the events I could barely register because I was still trying to absorb something I’d seen a moment earlier. I absolutely loved God’s Not Dead and didn’t think Pure Flix could top it. But I don’t know … its close. Do You Believe opens in theaters on March 20th. Prayerfully consider getting your church involved. Prayerfully consider inviting someone who doesn’t know God … or someone who may need to deepen their faith. Ask that He would show you who to invite, that He would prepare their heart to accept the invitation and be moved by the message. I pray that Do You Believe will further God’s Kingdom by bringing more lost souls to Him, by helping some get off the fence, and by encouraging others to do more for Him. Last year I blogged about watching God show up on the back end. This year, I hope more people will see Him move in advance. I’m so sure about the message in this movie that I believe God is going to show up once again and I can’t wait to see Him at work. I believe. The question is … do you?